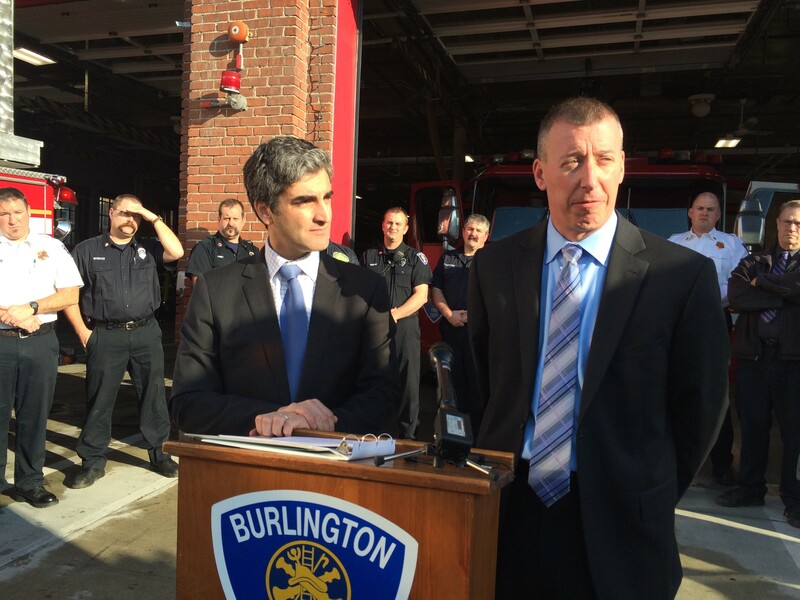 Mayor Miro Weinberger introduces his pick for Burlington's new fire chief: Steven Locke. At age 16, Steven Locke became a volunteer firefighter in his hometown, North Hyde Park. Now in his mid-forties, Locke is poised to become Burlington's fire chief, overseeing 79 firefighters. Locke spent two decades with the Hartford Fire Department, serving as chief for the last seven. Mayor Miro Weinberger acknowledged that Hartford's 20-person squad is much smaller than Burlington's, but he praised Locke's leadership, particularly in 2011, when he presided over the town's emergency services during Tropical Storm Irene. Locke left the fire department in mid-August to serve as Hartford's interim town manager after the previous manger abruptly resigned. Standing in front of the brick station on South Winooski Avenue, Weinberger told reporters that Locke takes an analytical and data-driven approach — attributes he seeks when selecting department heads. Firefighters lined up behind Weinberger and Locke for the announcement. Like many fire departments, Burlington's lacks diversity, with just one female firefighter and a single firefighter of color. Locke's appointment doesn't improve those stats, but the mayor said that increasing diversity — and reaching out to the city's refugee and immigrant populations, is "something I'm going to expect Steve to make progress on." The city council is expected to vote on Locke's appointment December 21. If they approve him, he'll start February 1. His predecessor, Seth Lasker, retired last summer after 26 years.